During the event, students work together in mixed groups, having a great chance to network with peers from other schools. 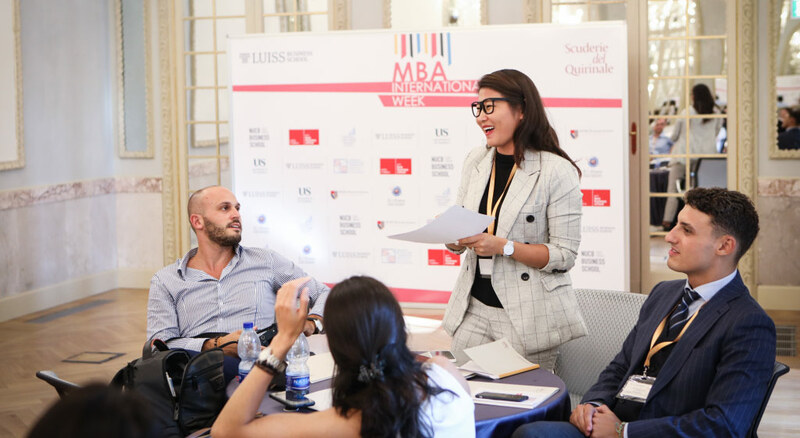 Groups work is supervised by LUISS Business School’s faculty. The event is held on the third or fourth week of September each year. The event is open to post-experience MBA students. Any Business School can send a request for the participation to bs.international@luiss.it. General request. The request should contain a short school description, including its national positioning, and a brief description of its MBA students profile (average work experience, international diversity in the class, etc.). In case of a positive response, each school should nominate up to 5 MBA candidates, providing their resumes. Students’ profiles will be evaluated by the organizers. MBA coordinators and directors are welcome to join and can participate for free. International office will select 5 most motivated students from MBA full-time and MBA part-time classes. The call will be announced in class in late May.